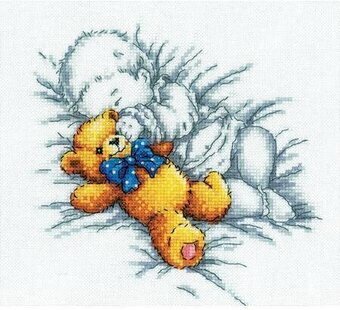 Cross Stitch Kit featuring a sleeping baby with his teddy bear. This Cross Stitch Kit comes complete with 14 Count Zweigart Aida, pre-sorted DMC floss, John James needle, easy-to-follow chart and instructions in English. 8" x 7 1/8". Model stitched over 2 threads on 32 Ct. hand dyed Sandcastle Jobelan with DMC floss. Stitch Count: 71W x 99H. 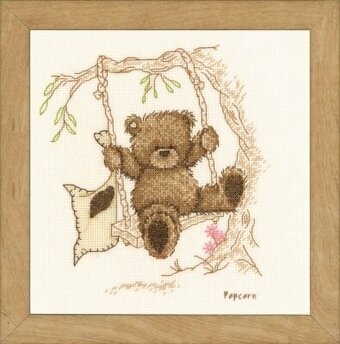 Cross Stitch Kit featuring a teddy bear with the sentiment "I Love You". 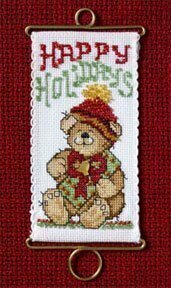 This Cross Stitch Kit comes complete with 14 count Aida w/printed background, 100% cotton floss, one needles, chart, and instructions. 8.6" x 10.6". 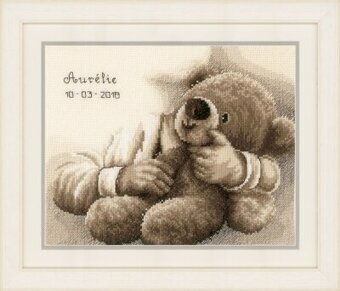 Complete kit includes 14 Ct. Ivory Aida, pattern, thread, needle and instructions. Finished size: 10" x 8". 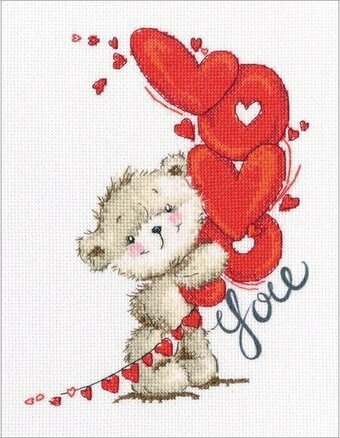 "Teddy Bear O' Teddy Bear, there's no friend like you. Someone to share my secrets with and cuddle too." A Teresa Kogut design. Model stitched on 14 Ct. Beige Aida. Stitch Count: 121W x 150H. 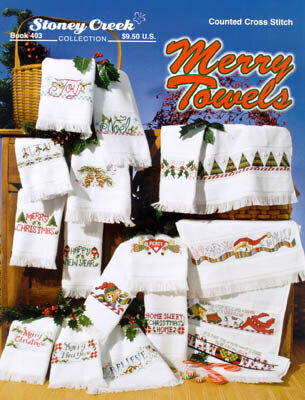 Kit includes 16 Ct. White Aida, pre-sorted floss, pattern, needle and instructions. 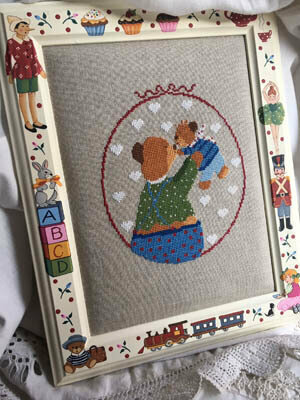 Finished size: 7" x 7"
Generations of stitchers have celebrated the arrival of a new birth with cherished memories of Bucilla baby designs. 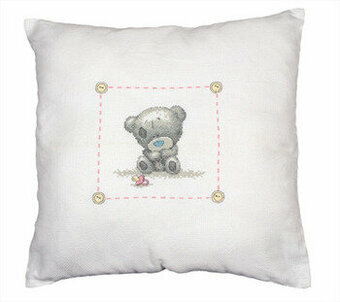 Our stitchery products combine the ease of an all-in-one kit with charming designs suitable for any nursery. From traditional to fanciful, each ensemble features quality materials, appealing colors and an unsurpassed attention to detail. Bib Pair kits include: 60% polyester / 40% cotton fabric, pre-quilted and pre-finished with designs stamped in washable blue ink, 100% cotton embroidery floss, needle and trilingual instructions. Bibs feature hook & loop closure. Size: 9" x 14". Complete kit contains 14 count White Aida ready made cushion cover, pre-sorted Anchor floss, needle, chart and full instructions. Finished size: 15 3/4" x 15 3/4" (40cm x 40cm). This pattern book includes a variety of designs for baby to stitch on Aida, bibs, sippy cups and receiving blankets etc. 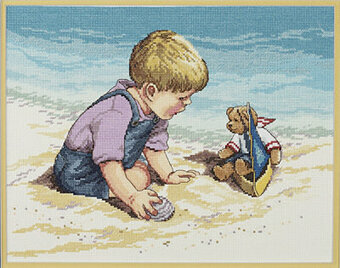 Includes a conversion chart for Anchor, Aida and J & P Coats threads.